Imagine it’s summer and you’re about to get into a swimming pool with your 2 year-old, who is holding his favorite toy—a small, stuffed giraffe with a rattle inside. He turns around and sees an overturned bucket and a beach ball. He sets the giraffe on the bucket, comes back, and follows you into the pool. He takes his giraffe everywhere, so how did he know not to bring it into the pool? How did he know to set it on the bucket and not the beach ball? Problem solving evolves in stages. Let’s start at the very beginning, when the giraffe was waiting for your baby the day you brought him home from the hospital. During the first month of life, babies learn about the world through reflexes, which are built-in problem-solving mechanisms. One of these, the rooting reflex, helps your baby solve the problem of getting food. If you touch his cheek with the giraffe, he automatically turns his head towards it in case it’s a breast or bottle. When he’s around 3 months old, your baby is on his back under a play mat with dangling toys. One of these is the giraffe. He swats at it, sees it move, and hears it rattle. He realizes his action caused a reaction. Around 5 months, when he learns to pick up the giraffe, he realizes that when he shakes it, it rattles. Discovering that his actions cause reactions thrills him, and he repeats deliberate actions again and again in order to produce the same result. By 8 months, your baby’s understanding of cause and effect helps him solve simple problems. He knows, for instance, that if there is a toy blocking his access to the giraffe, he can push the toy aside. 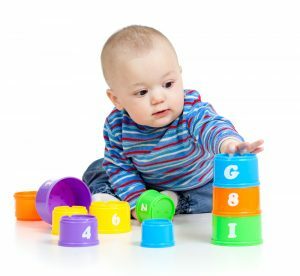 Around 9 months, your baby learns that objects exist even when he can’t see them. Before, if you covered the giraffe with a blanket, he cried because he thought the giraffe was gone. Now he knows the giraffe is still there, and pulls the blanket off to retrieve him. When he’s about 13-16 months old, your baby (a toddler now!) begins to solve problems through trying, failing, and trying again until he achieves his goal. He wants to put his giraffe into a rectangular container. It doesn’t fit because he’s holding it horizontally against the container. After a few tries, he turns the giraffe so it’s aligned with the container and, voila! Experimental play helps him learn about outcomes of different actions. What happens if he brings the giraffe into the bathtub? It gets wet, and you take it away and put it somewhere to dry. Where will it end up if he slides it across the floor? If he slides it this way, it ends up near the kitchen doorway; if he slides it that way it ends up near the fireplace. Improvements in memory bring a new tool to his problem-solving toolbox: Deferred imitation. Until now, his imitation was limited to copying something immediately after seeing it done. With deferred imitation, he can see an action and copy it at a later time. On Monday, for instance, he sees you use a step stool to retrieve an object on a high shelf. On Tuesday he sees his giraffe on a windowsill, drags a chair over, and uses it as a step stool to retrieve the toy. By 19 months, your toddler begins to engage in symbolic play. This pretend play appears because he now understands that one thing can represent another thing. Remember the container he had to figure out how to fit the giraffe into? Suddenly it becomes a bed for the giraffe to sleep in, or a boat for him to ride on. He uses trial and error to find other objects he can use for beds. He tries a ball (the giraffe rolls off), a column-shaped block (too skinny), a pyramid-shaped block (too pointy), and finally a book. Bingo! Not long after symbolic play begins, your little one begins to solve problems inside his head without resorting to trial and error: If he wants to pretend to put the giraffe to bed, he knows he must find an object with a flat surface that is the right size. Around 23 months, your toddler begins to understand that similar actions in similar circumstances produce similar results. He knows that anytime he puts his giraffe in water, whether the tub, the dog bowl, or the toilet (hello childproof door handles), it will get wet and you will take it away and put it somewhere to dry. Right around his second birthday, all of this comes together as we find ourselves where we started on this journey: At the pool, where instead of impulsively going into the water with the giraffe and suffering the consequence of you taking it away to dry, he finds a flat surface for it to rest on while he’s in the pool. Your child’s problem-solving abilities will continue to evolve in increasingly complex ways. Because he learns to problem-solve during play, the number one thing you can do to promote this essential skill is to allow him lots of unstructured time to explore and play.